Last night the Adelaide Food Central team visited newly opened Vietnamese restaurant Sen. 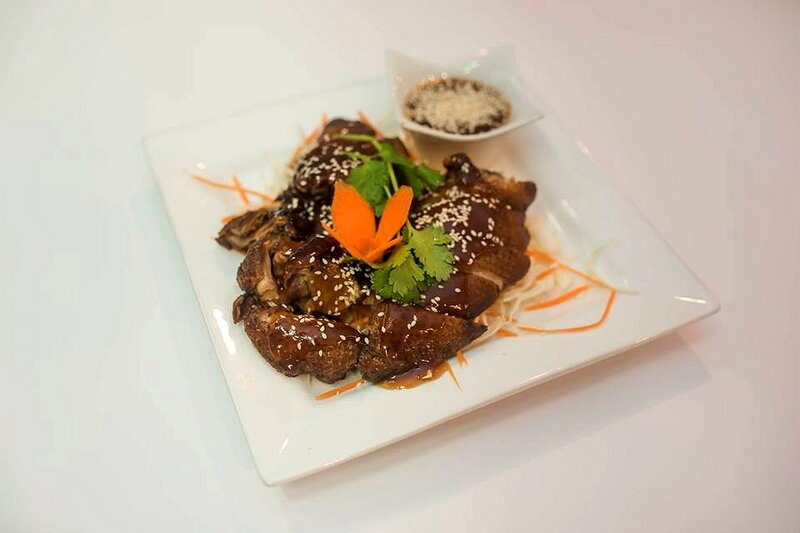 Located on Gouger Street in the city, this restaurant aims to give a modern take on Vietnamese cuisine. 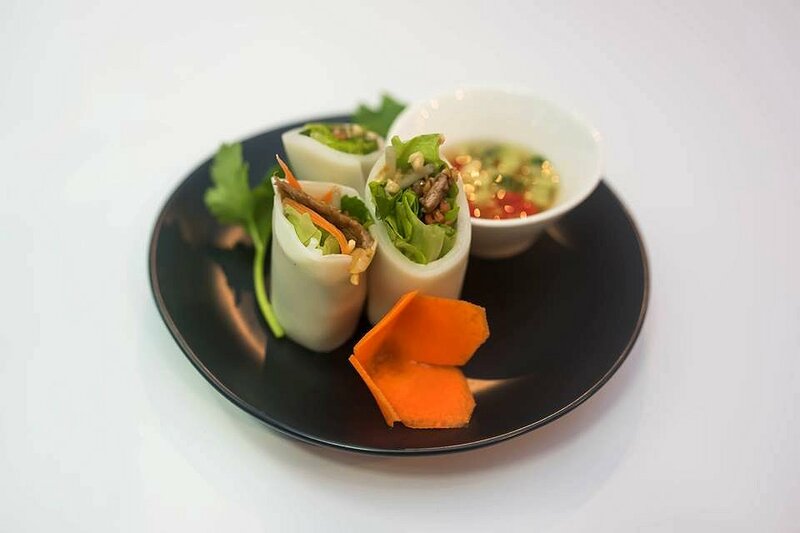 Sen, meaning Lotus in Vietnamese, has only been open for two months and is set up to be very elegant and modern, with beautiful art work and spacious surrounds. The venue can fit around 85 people so it is very spacious, with an outdoor seating area for guests as well. Upon arrival we were greeted by very friendly staff who clearly are very passionate about what they do. 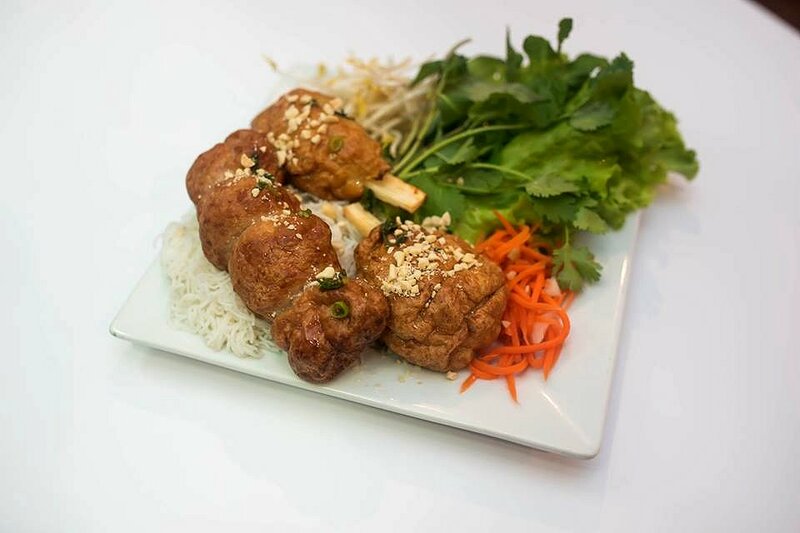 It is great to go to a Vietnamese restaurant and be served by people of Vietnamese origin who are knowledgeable on the food they are serving and how it should be eaten. We were told that everything in Sen restaurant is made fresh to order with no preservatives or MSG, which gives great peace of mind and another reason to visit this restaurant. 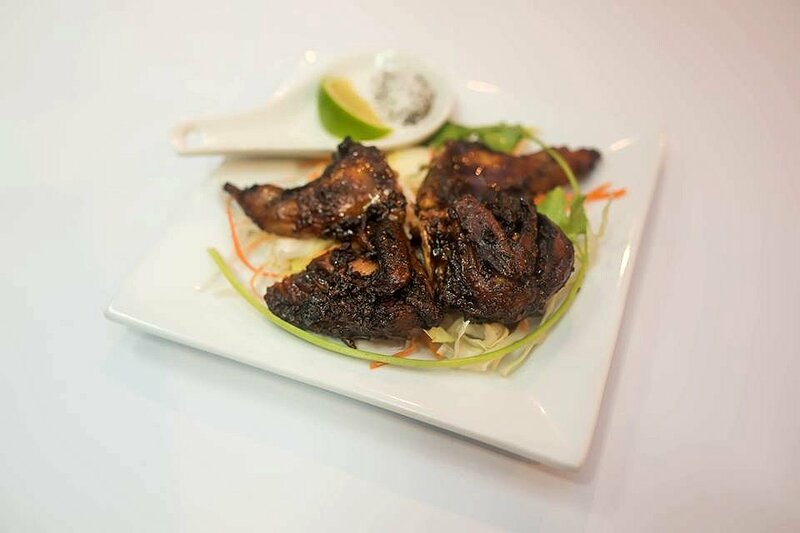 There are many dinner options on offer with a standard and specials menu to choose from. This makes it pretty hard to choose as everything sounds equally delicious. 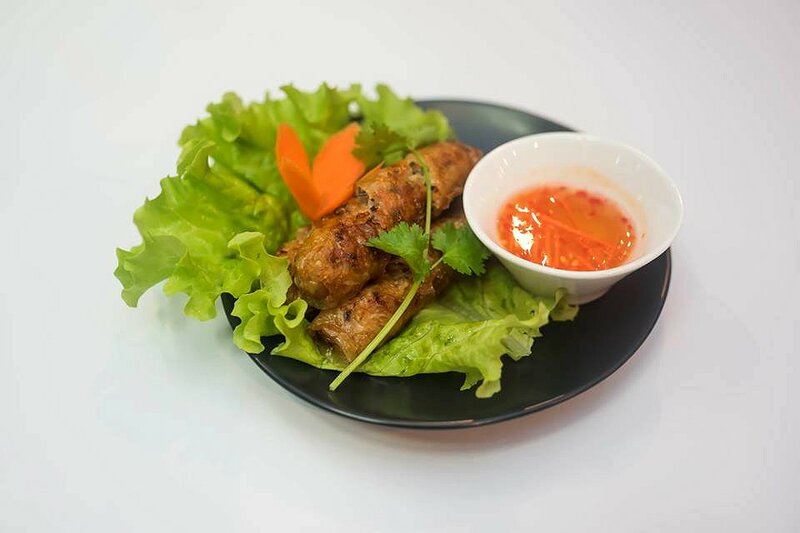 We first had the Vietnamese Beef Noodle roll which is beef wrapped in a Vietnamese noodle sheet. This is a dish I had never seen or tried before and was intrigued as to how it would taste. It was great. The beef was tender and was accompanied by fresh herbs and pickles. The firm noodle it was wrapped in provided a great texture and it was simply amazing. I was such a great start to the meal and the sweet sauce it was accompanied with made it even tastier. We also had the Vietnamese Spring Rolls or otherwise known as Nem. I am a big fan of spring rolls, who isn’t really? But this spring roll was very different to the typical one wrapped in a thick golden casing. This was wrapped in a thin and very crispy rice paper and filled with lots of meat and veggies. It was so delicious. I would happily eat two plates of these to be honest as it was so crunchy and full of flavour. When dipped in the chilli sauce it was amazing and a real winner. We also had a Spicy Marinated Quail for entrees which was delicious. It was tender and had the perfect amount of spice and flavour. I’ve never tried quail before and I’m not particularly a fan of spicy food, but I was so impressed with how delicious this was and the balance of spice it had. The only downside is that it was very messy and went everywhere. But it was still very enjoyable and quite literally finger licking good. For our main we had a combination of the Chefs signature selections. This included the Charcoal Grilled Prawns wrapped in sugar cane meatballs and Charcoal Grilled Pork Meatballs, both served with a special peanut and fish sauce, mixed vegetables, noodles and rice paper. This was essentially a make your own cold rolls station and it was simply amazing. The pork was tender and juicy and crispy on the outside. The prawn was much the same, but also with a slight sweet taste from the sugar cane. My favourite was the pork though, and it was fun creating them into cold rolls. I loved it accompanied with the pickled carrot, cucumber, coriander, mint, noodles and dipped in the peanut sauce. I was in heaven and would eat this again and again. We also tried another main dish of Roasted Duck. I absolutely love duck and will order it whenever I see it on any menu. I was intrigued to see how this duck was going to be served. It was a crispy skinned duck served covered in plum sauce and it was delicious. The skin was so incredibly crispy and the meat very tender and flavoursome. It was also deboned which made it easy to eat and would be up there with one of the best I have had. For dessert we were served a Chocolate Mousse. This has to be one of my favourite desserts and this one did not disappoint. It was presented beautifully with a sliced orange on top which made me incredibly excited to dig in. It was silky smooth and with the perfect consistency and rich chocolatey flavour. It also had a slight minty flavour which I loved as it brought freshness to the dish. It was devoured quick smart and was the perfect ending to an amazing meal. As well as the fabulous meals on offer, Sen also have an extensive drinks menu including traditional Vietnamese drinks. 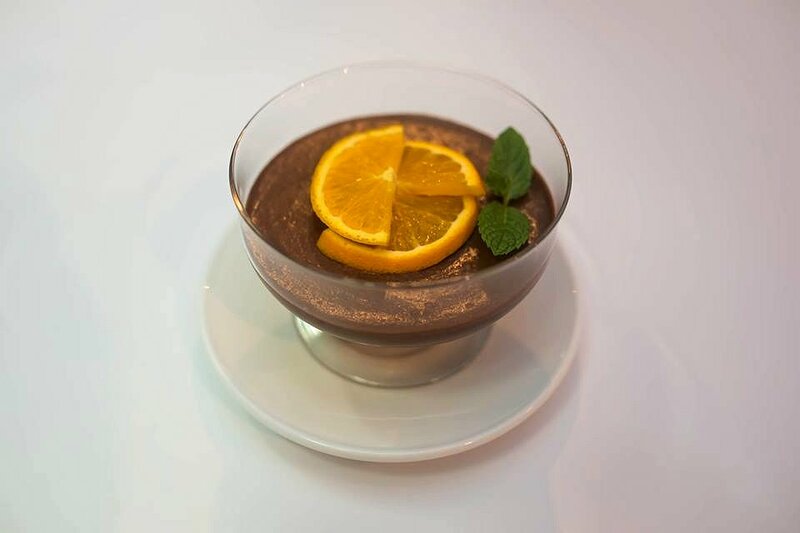 This includes smoothie flavours such as Avocado, Custard Apple and Durian, Coconut water and a Vietnamese sweet corn milk drink among others – admittedly not anything I was game enough to try but I’m sure would please anyone who loves traditional Vietnamese. I am so incredibly impressed by Sen restaurant. Vietnamese food is one of my favourite cuisines so I was expecting a lot, but my expectations were exceeded. Every dish tasted fresh, with the best ingredients and cooked impeccably. I left this dinner not feeling sluggish and overly full like I do after most dinners, which is what I find can be expected with Vietnamese food as it is so light and freshly made. I get the feeling that the owner and staff really care about what they are presenting to the public and I expect this restaurant to get more and more popular the longer it is open as it is sure to establish a great reputation amongst locals.